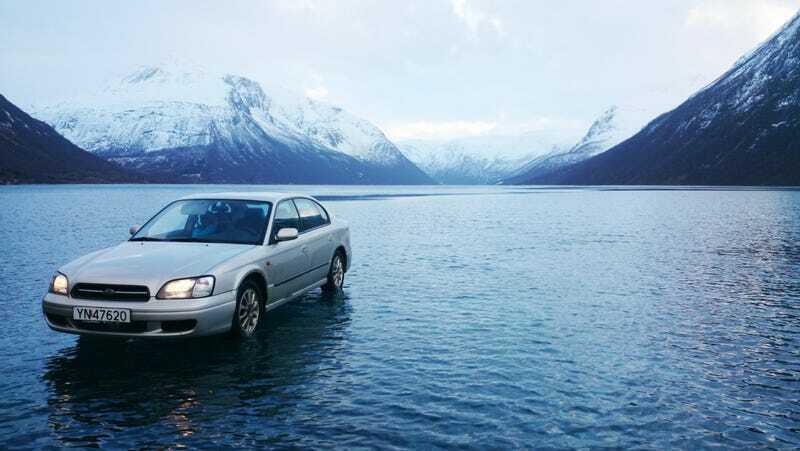 This picture of a Subaru parked in the middle of a lake isn't a Photoshop. It's very real and here's how it was done. The car is actually standing on 50 centimeters (a foot and a half) of ice. You're looking at Lake Storvannet in Ballangen, Norway, which has been completely frozen over this winter. Recent heavy rains, however, covered the ice with standing water. The owner of this Subaru, Atle Rishaug, took this picture and explained to NRK News that he simply drove his Subaru a little bit out onto the water-covered ice, parked, snapped a few pictures, and then drove back ashore. It was never danger. The ice under is a half meter thick. There is also a special permit to drive at high water to and from properties, Atle Rishaug told NRK.no. Rishaug posted the picture to the Ballangen Facebook page and replies have been pouring in, most notably Jesus jokes Rishaug has been laughing them up. We're a bunch of buddies who like to find funny stunts, and this incredible sight was a gift, says Atle Rishaug. You can see more pictures of Rishaug's little on-water expedition right here at NRK.no. And you can find Rishaug on Facebook right here to tell him all the Jesus jokes you want.